-SG- I was recently attempting to tidy my disordered files when I came across this photo of FDF869 which has all the appearance of a 1939 ES2. It is and it isn't! The registration number kings will identify FDF869 as dating from 1946. And when I bought it in 1959, complete with child/adult sidecar on the side, that's what it said in the log book. I think it cost me £40. I used it as regular transport for a year when foolishness and disaster struck! I took off the sidecar body as I had arranged with a friend to fit a channel to the chassis on which to mount my Vintage Model 18, to go to race meetings. I set off: without the sidecar body the bike was very lively on left handers and rounding one quite close to home at my usual speed, the wheel came up and - an automatic reaction I suppose - I straightened up a bit to get the chair wheel down, which of course took me onto the wrong side of the road. And who should be coming the other way at that precise moment but a nice 'ex-pat.' Pole driving an A35 Austin van. I went straight into him, landing on the bonnet and when I opened my eyes a couple of seconds later, I saw him looking out at me in considerable astonishment through what was left of the windscreen! The boring aftermath of visits to hospital etc. do not need repeating but in due course I got the outfit back home. The forks were entirely knackered as were the front wheel, mudguard and the front of the sidecar chassis. There did not seem to be any other damage, apart from the big dent in the tank visible in the photo. but I felt uneasy about the frame and resolved to change it for another if I could. As it happened, my old friend Frank Pearce had a bare frame from a 1939 ES2 with no documents which I had for a couple of Pounds, while a new set of ex-WD forks from Russell Motors (still going) in Battersea cost me a tenner. Frank came up with a front wheel and mudguard suitable for the WD forks (brake on the left, whereas mine had been on the right). I literally swopped everything over into the 1939 frame and thus it became more 1939 than '46. 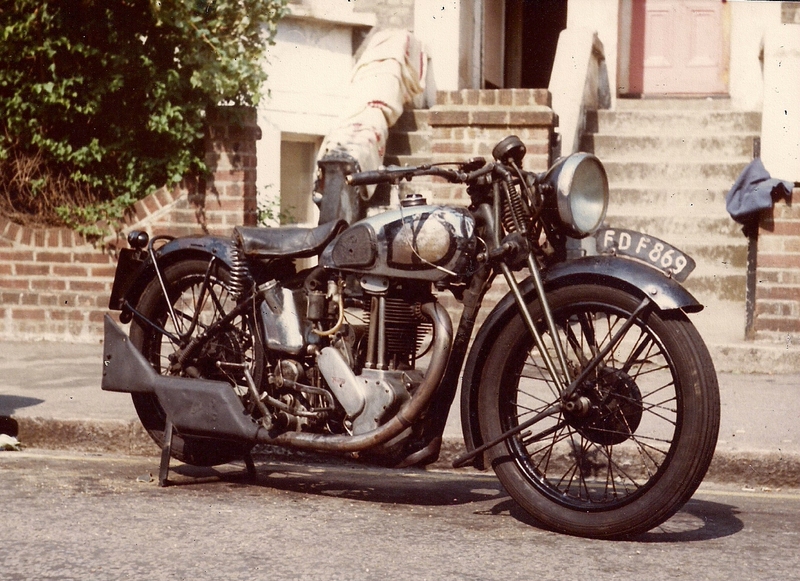 As far as I recall - and as it's now 57 years ago, my memory is a bit hazy - the 1939 ES2 frame differed from the 1946 Model 18 version in the provision of pillion footrest lugs on the rear frame tubes. I think one had them and one didn't, but not sure which. I sold it in 1984 for not very much money and the new owner provided the photo not long before he and a friend departed on a somewhat disastrous trip, I think to Greece. Wish I'd kept it!